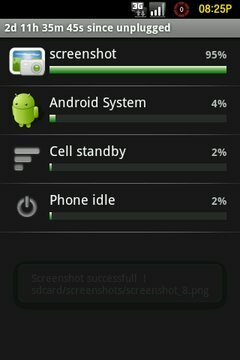 This is a very simple application that dramatically increases your battery life - up to 2.5 days standby time! No task killers or other stuff needed for longer battery life. 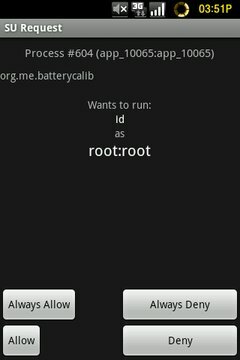 Best if used right before your phone is about to shutdown, this application simply backs up and then removes batterystats.bin system file and gracefully shuts down your Android phone. While your phone is completely OFF, charge it overnight and make sure it is a good FULL charge. Then simply turn you phone in the morning - fresh batterystats.bin file will be regenerated by the system - and enjoy fantastic battery life! May be used as soon as you detect poor battery performance. 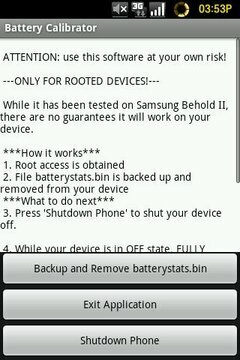 Has been tested on a multitude of ROOTED devices. Add date: 17 октября 2012 г.